What really matters: Paisa, Power and Party. Whatever happened to Patriotism? Paisa, Power and Party. Whatever happened to Patriotism? Listen to any politician on TV today (not talking about the media group), they will try to convince you knowingly or unknowingly that there is nothing wrong in what they are doing. Be it dividing the nation on casts and saying it isactually to promote brotherhood, or running away from accountability and giving the silliest of excuses in response or putting National interests on backburner and proudly justifying it. The political establishment of the country has sunk deep beyond the limits of shamelessness. A Nation is govern not by people, but by ideals. I am sure, our politicians have not used this word since years! After a politician is elected to become Prime Minister of the country, he should ideally think of himself not as a member of the party but as the Prime Minister of the Nation. Same should happen with the cabinet ministers, at least. They are not referred to as ministers of Congress or BJP but of India. On the contrary, every single person who knows the name of the PM of India, also knows that the actual policies are formed in a party head-office rather than in PMO. Not a single opportunity is missed in making a political statement. It is actually a matter of pity on us as well, the voters of the country, that we knew and criticized it since 9 years but the situation is yet the same! 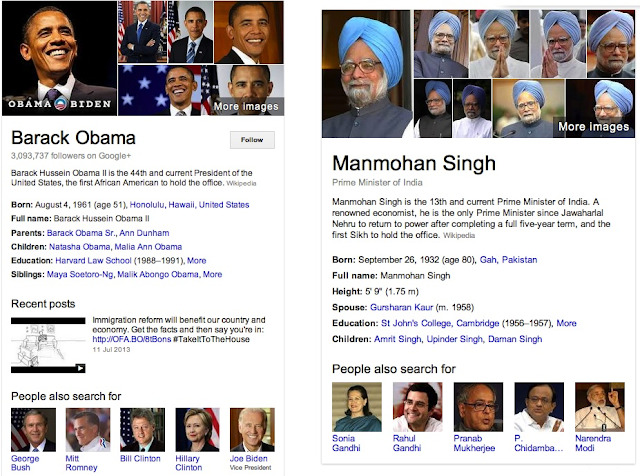 The irony of the nation is that if you search online for Barack Obama, for instance, you will get similar people suggestions in George Bush and Bill Clinton but if you search for Manmohan Singh instead; Sonia Gandhi and Rahul Gandhi will feature up in the suggestions list! Even a search engine knows it, goddamnit! A person who talks about the National Interest in serious meetings or at national level is either laughed upon or criticized by the peers. He is usually considered naïve enough to know the practicalities of business, whatever it is. When was the last time you found a policy decision taken by the Government by actually keeping the National interest in mind and not the Political gains? The present set of priorities governing the actions of our politicians can be easily figured out even by a school going student. The situation is grim and very clear. The worst part is that there seems no willingness to improve. They do not want to be monitored, held accountable or tried in the court for their wrongdoings. At the time when the Nation requires a strong and patriotic leadership at the top, the reality is not very convincing. Things can be made better from the bottom of the pyramid as well and many people are working for it as we speak but the pace we need for transformation can only be reached when the flow comes from the top. That’s where the real power is. Can one party do it? Can one person do it? Not sure! But if we vote-in the people based on the merit of their character and performance reminding ourselves and educating others of the track record they have, then we can keep the bad eggs from entering into, what are called, the houses of democracy. Voting is the right we still have and let’s not wait for the day when it is also undermined by wicked politics! Today, though patriotism looks like a word of last century, present India certainly needs people who are patriotic and who feel for the nation. Patriotism is good when it is in songs, movies and in the words of politicians; but it is better when it’s in one’s heart and mind, uninfluenced by the devils of money, position and power; because only then it can translate into real actions. Its true and disappointing, lets try to be wise in choosing our leaders. Also lets hope that better leaders hit the stage!